The IP-16 is a WheatNet-IP compatible control surface. It operates exactly as you’d expect a radio console to operate with the added benefit of being able to access the WheatNet-IP AoIP intelligent network. This allows you to access sources wherever they live on your network. 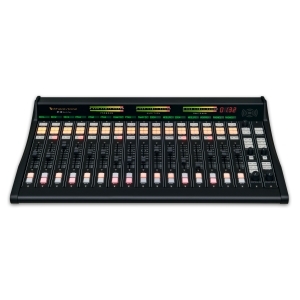 The IP-16 is a 16-fader control surface that taps into the power of the WheatNet-IP Intelligent Network through its IP88CB console audio BLADE engine to make a perfect low-cost, small-footprint solution for any studio. Each of its 16 input modules is equipped with an LED source name display and an A/B source selector; sources can be set via a rotary encoder in the master section. Each input module has access to four program busses and has cue and talkback switches. A 100mm long-throw fader and lighted channel ON/OFF switches round out the module. 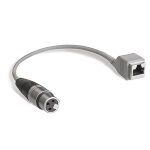 The IP-16 control surface connects via Ethernet to its audio engine, the Wheatstone WheatNet-IP ip88cb console audio BLADE. A powerful 1RU device containing the console’s digital signal processing, input, output, and logic circuitry, the engine has no fans and may be located either next to the console or at a remote location.The master section offers control room, studio, and headphone controls with source selection, and an onboard headphone jack and amplifier. Timer controls, a master talkback button, and a built-in cue speaker with volume control are provided. 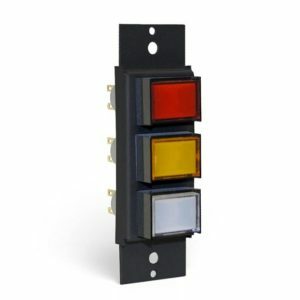 There are four event switches and six programmable buttons available for user functions. The meter bridge has three stereo pairs of bright 30-segment horizontal LED bargraph meters, as well as an onboard timer with controls located in the master section. 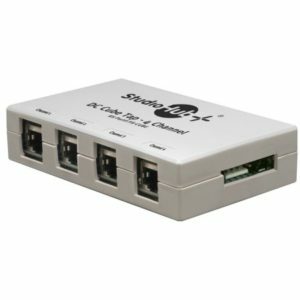 100 megabit Ethernet port for connection to network, also carries cue and headphone audio back to the control surface.